As you can see from the picture, berries and cream are a jumble, hard to get a clear shot of a fool.. For all of you non bakers, this is the dessert you can be known for. The combination of seedless jams and fresh fruits are endless. I understand the original recipe used Gooseberries, which if you have never tried, resemble the taste and texture of Kiwi. Putting this on top of a warm waffle would make the best weekend breakfast ever. If you fold crushed meringue in, you would have Eton Mess – named after the exclusive school in England, brought to the attention of the world with England’s biggest wedding this past year. 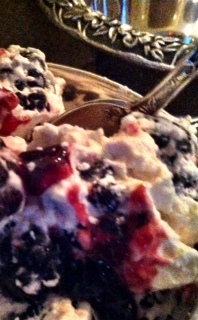 This entry was posted in Recipes and tagged Blackberries, dessert, Eton Mess, Fool, Whipped Cream. Bookmark the permalink.